COMPANY PROFILE Bank of Baroda provides banking & financial services. Its products include current accounts, savings account, salary account, term deposits, recurring deposits, online banking, loans & overdraft facilities. Bank of Baroda is a state-owned banking and financial services company in India. The company provides personal banking, corporate banking, international banking, small and medium enterprise banking, rural banking, non-resident Indian services and treasury services. The bank provides service to an international customer base with branches in 24 countries. The bank focuses on meeting the capital needs of its clients by providing loan services. The company also provides a banking system that emphasizes Internet and mobile banking. Organizationally, the bank is divided into four segments: Treasury, Corporate/Wholesale Banking, Retail Banking, and Other Banking Operations. 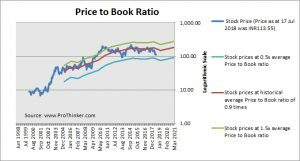 At the price of INR113.55 as at 17 Jul 2018, Bank Of Baroda is trading at a Price to Book Ratio of 0.6 times current book value. 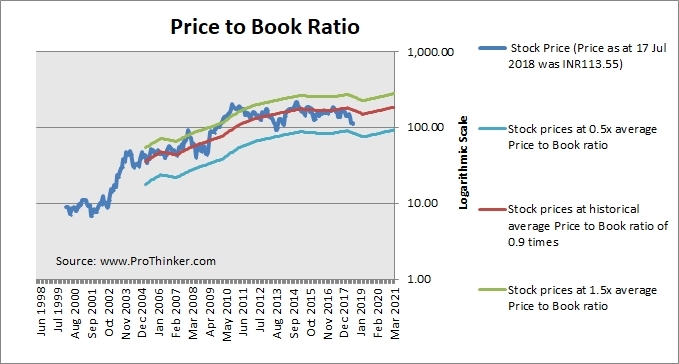 This is a 33% discount to its historical average Price to Book Ratio of 0.9 times.